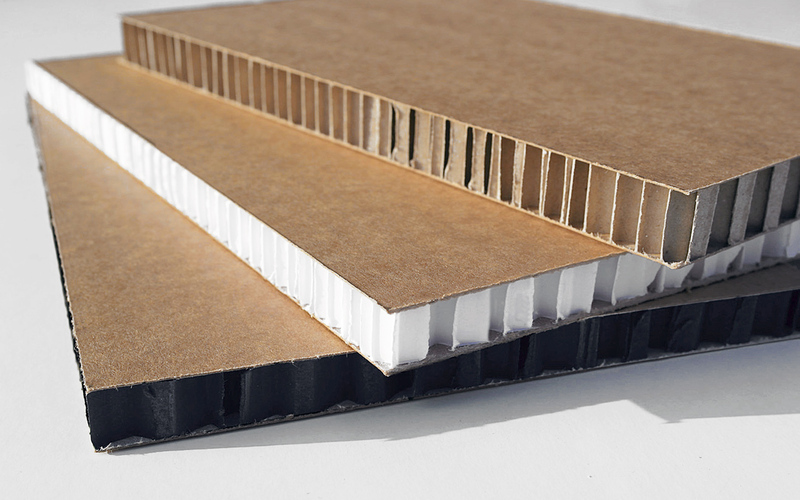 In the last years thanks to innovative techniques of press “flat-bed” and of cut in plain, Tivuplast has created a new range of panels called “Nidoboard”. 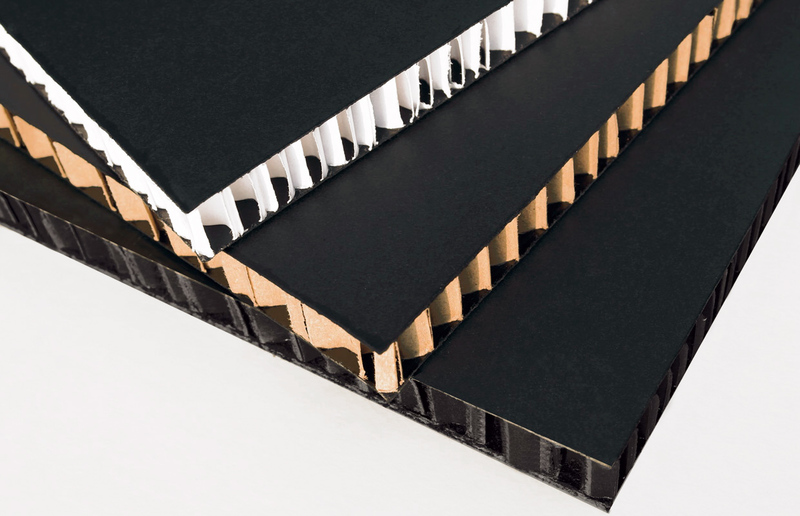 Created with inside structure in alveolar cardboard, these Nidoboard panels are covered with high-grammage outer facings produced in these colors: kraft-liner avana, white varnished black. 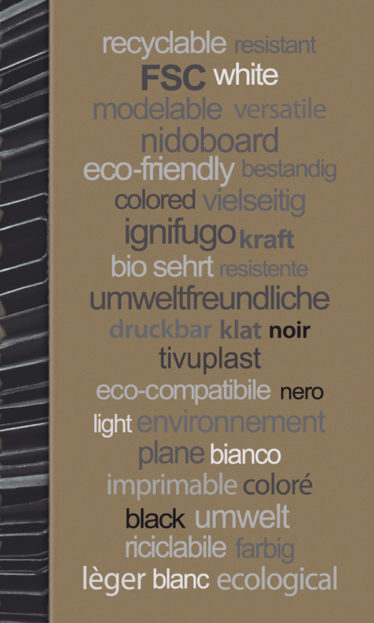 Even the honeycomb cored panel is created in three colorations which combined to the covers of equal or different colors, they confer to the Nidoboard, an elevated predisposition to being used in the visual communication, in the design of furniture. strong, flat, resistant and light weight panels which can be easly cut and shaped in customized geometrical forms. Nidoboard is also printabile on both sides and is suitable for displays, totem and exhibitors for shop windows and also for stands and temporary events. 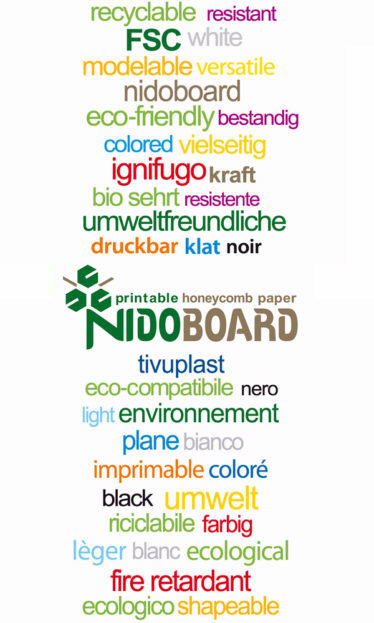 With Nidoboard, Tivuplast has changed the way to use cardboard honeycomb panels, proposing original, innovative and eco-friendly solutions. 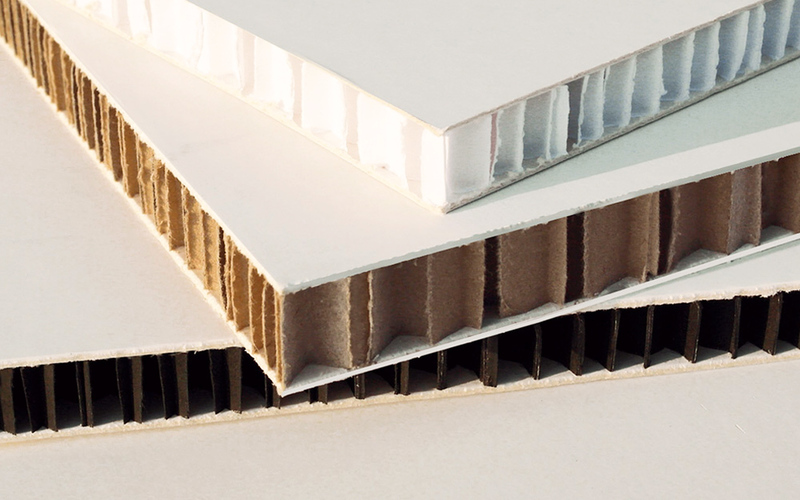 Nidoboard panels are made of an hexagonal honeycomb structure in cardboard and covered with high-quality high-grammage outer facings. Basic colors are kraft-liner avana, white varnished and black. Available even in new ranges of colors. 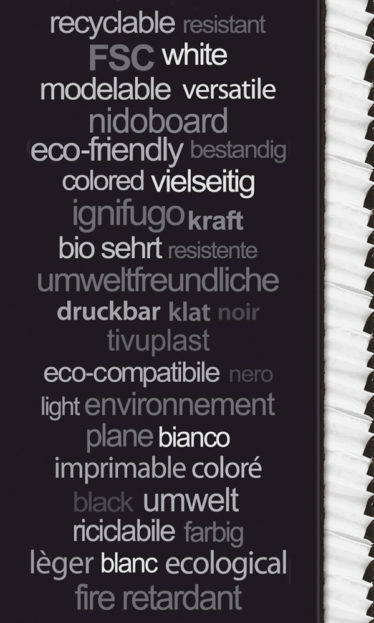 The honeycomb core, besides the traditional avana color, is avalable in the new white and black version. Thanks to these three honeycomb cores and to three possible Nidoboard covers we have nine possible and personilized combinations. The hexagonal structure makes this material light to manage but at the same time able to support great pressure according to the paper grammage used and on the dimension of the cell. The smaller the cell the more the compression supported. The substances of the covers reach the 500 gr/sm. in case of the varnished white, with excellent mechanical characteristics. So we can have very high resolution graphical printings. The panels can be available in standard mesures of 305 cm. in length and 110 cm in width, with 10-16-20-30-40-50 mm thickness. For different or specific needs you can request indications and prices here. 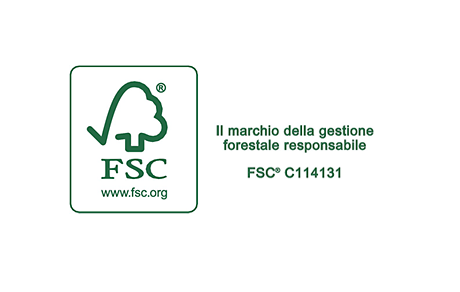 The whole range of the panels Nidoboard is certified from the mark FSC which guarantees that this product has been created with basic materials from forests correctly managed according to the standard principles of the forest management and the chain of custody.